Advancis Colicomfort is a food supplement of natural origin that associates charcoal with fennel. Charcoal adsorb intestinal gases, helping in flatulence and reducing intestinal distress and bloating sensation. 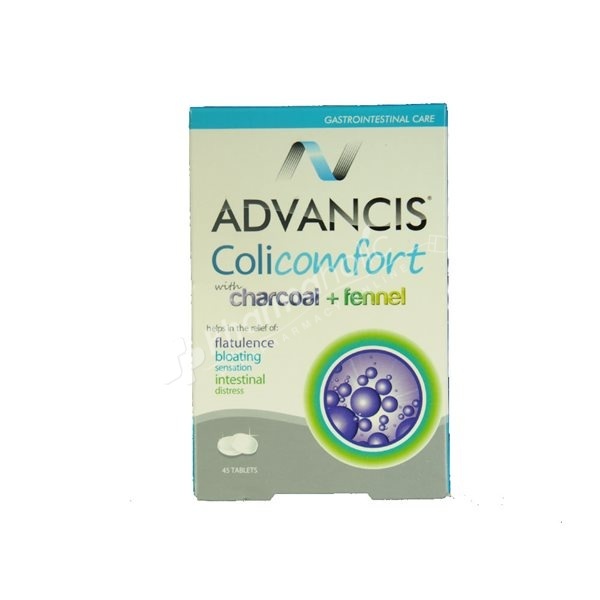 Advancis Colicomfort is a food supplement of natural origin that associates charcoal with fennel. Charcoal adsorb intestinal gases, helping in flatulence and reducing intestinal distress and bloating sensation. Fennel, a natural digestive stimulant, has also been traditionally used in flatulence situations and distended abdomen sensation. Take 1 tablet after meals whenever needed. Do not exceed 3 tablets a day. Charcoal 27,8%; Lactose; Saccharose; Foeniculum vulgare, Fennel (Seeds) 11,4%; Polyvinylpyrrolidone; Gelling agent: Arabic Gum; Anti-caking: Magnesium Stearate, Magnesium Silicate; Flavour. Do not exceed the recommended dosages. It is recommended to intake water. Not suitable for infants and young children and during pregnancy and breastfeeding. The charcoal can decrease the effect of medicines administrated orally. The ingestion of charcoal can cause dark colored stools.This product must not be used as a substitute of a varied diet.